Five Points Festival returns June 2 with a new home in Brooklyn NY! Designer Toys, Street Art, and NYC’s Best Craft Breweries and Food Trucks Collide at the Brooklyn Expo Center! New York, NY (April 19, 2018) – Five Points Festival, a designer toy, street, and alternative art festival is excited to announce the return of the much-anticipated event for 2018! Taking place the weekend of June 2-3rd, 2018 - at the awesome Brooklyn Expo Center, the festival will bring together the shining stars of the Designer Toy, Kaiju & Sofubi, Craft Beer, Food and alternative art worlds. Tickets to Five Points also include access to a gathering of some of NYC’s outstanding craft breweries and food trucks serving during all regular Festival hours. VIP Ticket holders will gain special early access privileges each day of the Festival, as well as entry to Friday night’s Designer Toy Awards, the world’s premier accolade for designer toy artists, and an all-around excellent party. Doors Open at 10am for VIP's. Roll like a P.I.M.P - Get a VIP ticket for Five Points Fest 2018, Designer Toy Awards & Early Access and MORE! DTA Ticket – Party with us at the Designer Toy Awards and rub elbows with the best in the industry! - THE ONLY WAY TO GET A TICKET! Exclusive Toy - Mini Erosion Molly by Kenny Wong and Instinctoy from Japan. Official event poster pictured above. Designed by amazing West Coast poster and tattoo artist, Thomas Fernandez (https://www.instagram.com/liveradstudios/ ). 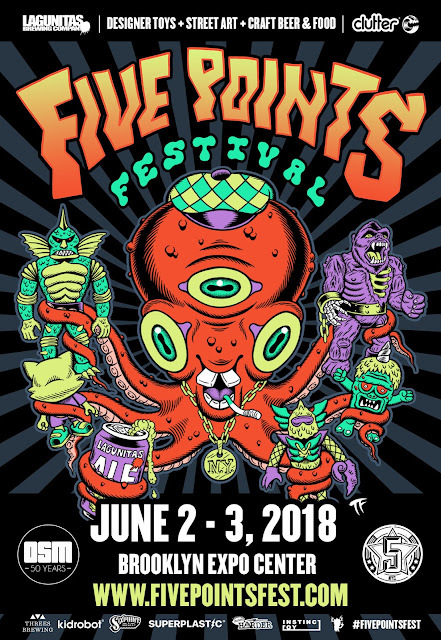 The Five Points Festival is a collision of designer toys, street art, alternative art, and craft beer curated by Clutter Magazine and Fueled by Lagunitas Brewing Company. 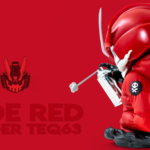 A designer toy festival in Brooklyn’s Greenpoint Neighborhood, Five Points Fest is two days and nights of vinyl and plastic toys, original art, indie designers, resin, plush, blind boxes, blanks, minis, kaiju, Japanese vinyl, posters, prints, apparel, craft beer and more – kicked-off by the 2018 Designer Toy Awards. The antidote to the average con, Five Points brings tastemakers, misfits, and rebels together with the new, retro, and infamous in a one-of-a-kind marketplace.